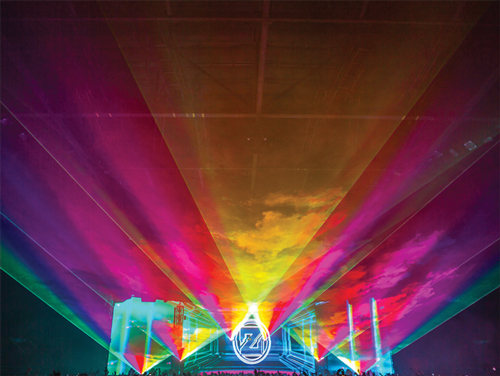 Although laser-based light shows have existed for 40 years, with artists such as Pink Floyd and Led Zeppelin being among the first high-profile acts to use them in their concerts in the mid-70s, laser shows have advanced dramatically in their quality and sophistication. Today, venues range from small-scale settings like theatres and nightclubs, to huge outdoor arenas for events such as the Olympics. In addition to projecting onto walls or screens, more complex, immersive, 3D effects can also be achieved by shining the light onto water screens, smoke, fog or mist, noted Andreas Zuck, market development manager at laser manufacturer Coherent. ‘All that is required is something in the atmosphere that will scatter the laser light in the direction of the viewer,’ he said. 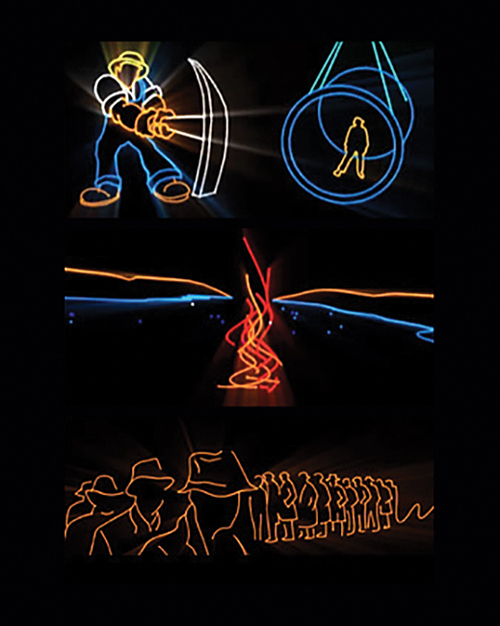 In general, two types of laser technology can be used for light shows. For low- to medium-end applications – such as for nightclubs or small, outdoor venues – direct diodes are popular because they give a good performance at a low cost. But for high-end applications, such as large outdoor events, more advanced laser technology is required in order to achieve the power and quality needed for these sorts of venue. The type of laser depends on the size and nature of the event. 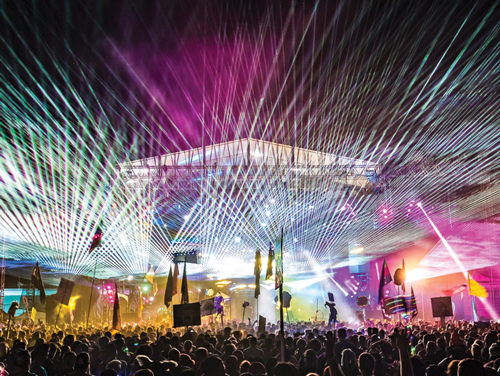 For example, a laser show at a local nightclub will use a different laser from that used on a main stage at Glastonbury,’ commented Justin Perry, CEO of Pangolin Laser Systems, a laser light show company offering laser projectors, software and safety accessories. 'Generally, in our industry, diodes are used. As you get into higher power systems, people will also begin to integrate optically pumped semiconductor lasers (OPSL),’ Perry added. Again, powers vary with the application, but for a small disco or local nightclub, for example, around 1.8W to 3W of power is typical. For larger indoor venues or small outdoor festivals, anything between 6W to 12W is needed, according to Perry. Outdoor festivals or stadiums require ‘lasers with 12W up to 20, 30, or 40W in power. Starting from around 20W, we use a combination of direct diode and OPSL,’ Perry said. Although the cost of OPSL is much higher than direct diode technology, it is used for creating much more sophisticated effects at high-end events, and the organisers normally have a large budget for this, Zuck explained. On the other hand, the lower cost and ease of use of diode-based projectors mean these are finding their way into more mainstream applications. The quality and variety of effects possible with direct diode-based laser projectors are advancing. This is not just because of how laser sources have improved over the years, Perry noted, but because of faster, more reliable optical scanning systems and control of the laser. These are important factors to create more complex and attractive visuals, he added. 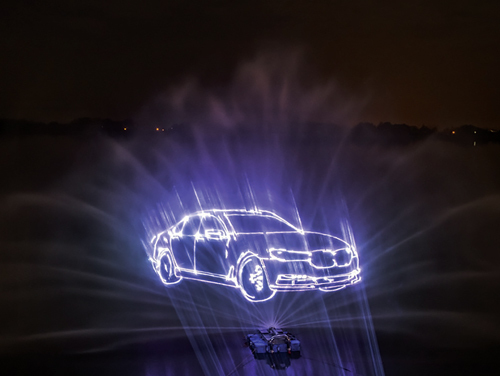 In October, BMW held the corporate launch of its new 5 series, at which high power direct diode lasers traced a rotating model of a BMW so that it appeared as if it were floating in mid-air. Although it has been possible to project logos for some time, in the past, three or four laser systems would be required, because no single projector had a fast enough optical scanning system to trace all of the points in the image to give the desired effect. 'So, you’re starting to see more complex projections like that [shown at BMW] beginning to take root – it’s not just laser beams now; it is text, graphics, logos, fully animated laser shows,’ noted Perry. An optical scanning system contains motors that move and direct the laser beam on an XY axis, which is essentially what allows the creation of various laser effects. A good quality laser projector should contain an optical scanning system capable of running for long periods of time – crucial for most entertainment applications. Perry pointed to Compact 506, Saturn, or Cambridge 6210/6215 as reliable optical scanning systems. Another fun effect being used to wow audiences – or potential customers – is what’s known as ‘interactive laser control’, where the laser beam moves in relation to a person’s body movements. Nike has employed this technique using Pangolin diode laser systems to create an interactive game of football. The outline of the pitch was projected, and the main players were highlighted by cones of laser light, which were different colours depending on the team. As the players moved, the light cone moved with them – this was done using an Xbox Kinect controller linked to a control system inside the projector. These new ways of controlling the laser – such as with an Xbox controller – are helping light effects become accessible to non-professional users and enter more mainstream applications. Previously, bulky cabling connected the controller to the laser; however, in more modern projectors, all of the control is built into the laser, noted Perry. Higher end venues and more sophisticated displays place more specific requirements on the laser source, particularly when the displays are viewed over large distances. For example, one of the largest light displays in the United States, the Grand Coulee Dam light show, runs every year from May to September on the side of the Grand Coulee dam in Washington, USA, and involves images shone from distances of more than one kilometre. Designed by LumaLaser, the show combines colourful lasers that move across the entire span of the dam (1.6km), creating moving images that virtually dance across the spillway. According to Coherent’s Zuck, these types of shows now invariably need a broad palette of colours, which is typically achieved by mixing the output of at least three wavelengths – red, green and blue – and frequently, even five lasers – red, yellow, green, cyan and blue. ‘The use of more lasers delivers a wider colour gamut. Inclusion of yellow and blue, in particular, enables delivery of a white beam, which is quite difficult to achieve otherwise,’ he said. In terms of output characteristics, another important requirement is high output power in order to deliver a bright display that can easily be seen over large distances, added Zuck. Similarly, good beam quality (essentially TEM00 mode) is necessary so that the beam doesn’t spread significantly over long projection distances, limiting display resolution. ‘Finally, since many of these shows run daily, with projection equipment located in difficult to access areas, reliability is also an important factor,’ Zuck said. Coherent markets Genesis Taipan lasers based on OPSL technology for the entertainment industry, and a number of light show engine manufacturers and show design companies currently use them. These include LumaLaser (Eugene, OR, USA), LaserAnimation Sollinger (Berlin, Germany), Lightline Lasertechnik (Osnabrück, Germany), Kvant (Bratislava, Slovakia), Ray Technologies (Valley, Germany), Tarm Showlaser (Bochum, Germany), Tarm laser technologies (Herne, Germany), and Lobo (Aalen, Germany). 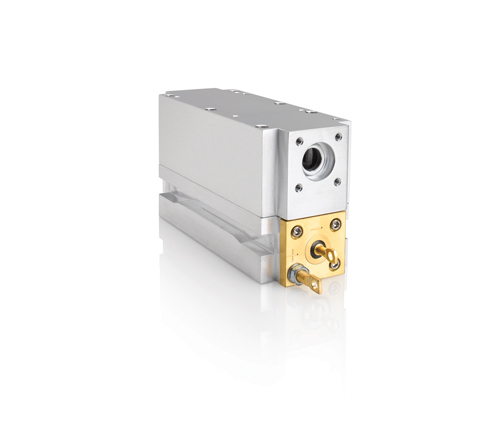 Coherent’s patented optically pumped semiconductor lasers are based on a compact semiconductor emitter, but use a novel internal optical arrangement to deliver much higher output power – as well as better beam quality – than traditional laser diodes. Zuck noted that the technology is well suited to entertainment applications because, firstly, the design approach can be configured to deliver any colour from deep violet through to red-orange, according to market demand. In addition, it readily lends itself to power scaling, so can be made to produce as much as several watts of output power – depending upon the specific colour – without any significant sacrifice in lifetime or reliability. Finally, Zuck continued, like other semiconductor lasers, OPSLs can be directly modulated, which lowers system cost by eliminating the need for external modulators. Photonics technology is not just aiding in the creation of light displays, but helping to ensure their quality. 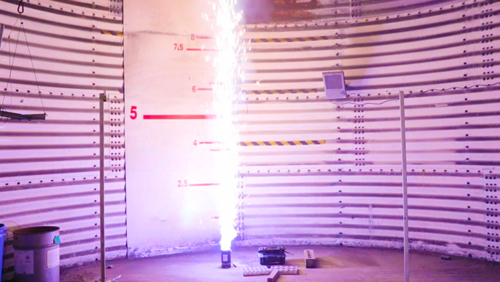 Le Maitre, a designer and manufacturer of both stage pyrotechnics and smoke and haze machines, has been using spectroscopy to analyse the quality of its products, which have been deployed at concerts for Taylor Swift, Beyoncé and Metallica. Spectroscopy was employed by the company to measure different variables for its light flares, which are typically used on stage or put in champagne bottles in nightclubs, for example. ‘The first thing [Le Maitre wanted to find out] was: how long does the flare actually burn for? The second part was: is it a consistent colour throughout the run? And the third part of it is testing raw materials; are we getting in what the supplier tells us we’re getting?’ said Tony Boutle, senior sales engineer at Ocean Optics, which supplied the spectrometers Le Maitre used to test its flares. One issue that Le Maitre picked up on was that its flares weren’t consistent in colour. This was because some of the components they had bought, which were responsible for producing a red colour, were contaminated with sodium. Because sodium burns yellow, the flares containing the contaminated components emitted an orange colour when burned. Ocean Optics’ Flame miniature spectrometer was used by Le Maitre for this, along with the company’s OceanView software.